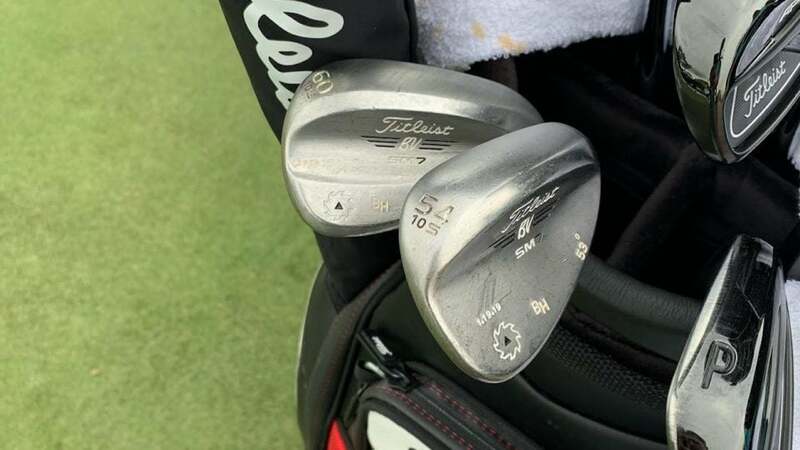 What's the deal with the date stamped on Bill Haas' Vokey wedges? Bill Haas has the date his wedges were made stamped on the head. Custom stamped wedges are everywhere in the professional ranks. These days, players usually have something personal added to the head for different reasons, whether it's to remind them of their family, where they went to school or lyrics to a favorite song. A quick glance at Bill Haas' Vokey wedges would lead you to believe the date "1.19.19" stamped on his Vokey SM7 is a significant one. Only, this particular date has nothing to do with an anniversary or birthday. Before wedge stamping turned trendy, it served a far more practical purpose for professional golfers and the reps who serviced their clubs on a weekly basis. In Haas' case, the date stamped on the head represents when the wedge was created. Vokey's Tour rep Aaron Dill adds it to wedges for various tour players as a way to remember when it's time to build a set with fresh grooves. @vokeywedges @titleist The Bill Haas gamers, check out the born on date. A great way to keep track of when it’s time to replace your wedges. So how often do tour players get a fresh set of wedges? The answer varies, but it's typically every 3-6 months during the season. Tour players spend countless hours working on their short game, which means the grooves on their wedges wear out quickly. Some players will even request a fresh set before each major championship — or at the very least a new lob wedge — and break them in a week or two prior to ensure they have the right amount of zip. If Haas goes by the same rule of thumb, he's due for a fresh set in the next month or so, and with major championships on the horizon, there's a good chance he'll be getting new scoring clubs from Dill in the not-too-distant future.